This year has absolutely flown by; with the birth of our first child at the end of March, wrapping our first home renovation and settling into our first single family home, getting back to work after maternity leave and Colton starting his own business, we’ve had more than enough on our plate to make life feel as if it’s passing at warp speed. We always knew we wanted to get back up north where it all began for us, we knew we wanted to raise our kids there and put down roots eventually, we just didn’t know it would come this fast. With some transition in Colton’s job position, with us in search of a childcare solution we could trust, rely on and afford, and the turning of another decade for both Colton and I (the big 3-0), we knew that our time was now. One of Colton’s 5 year goals was to start his own business - he’s a hard worker and has never been a “follower” at heart, a true-born leader if you ask me; full of ideas and passion to pave new roads while guiding others down exciting, successful paths. Opportunity to start our own business NOW: Our thought was if we did this now, at the age of 30, we hope to see true success in the business within 10 years and hey, we’re not getting any younger so we’re better off taking the leap while we are young and motivated. With a change in Colton’s position at work, it made most sense for him to pursue his own business now rather than finding an interim job in Minneapolis that may or may not pay off for him but most importantly, wouldn’t satisfy his entrepreneurship goals. Job stability: I am blessed enough to have an extremely supportive employer and flexible position that would make this all possible for us, as we take a leap of faith putting this business together. Bringing up the tribe: Maija would be able to grow up where WE loved growing up and kids, and be in the care of people we trust (without breaking the bank as a bonus) AND with the support of our family and friends. We can feel good about who she’s with while we are busy making sacrifices for our family and pursuing our passions - setting an example for her and our future kids - that working hard and being passionate about your personal goals pays off. We will be closer to the ones we love: Although we will be further from many that we love here in the Minneapolis area, we will be able to spend more time with both our parents and some life-long childhood friends. Financially speaking: This is the right move for us at this point in our lives, we can get more of what we need for less and plan for a more successful future and financial freedom. Of course, starting a business is not free, but we see opportunity with a little investment in this place. Slower pace: This may not be understood by those that have always lived the city life but there is something about the Northwoods that puts one at ease, makes you slow down and ENJOY what is in front of you. Life is a little slower and a little simpler and everything in us is begging for this right now. Huntin’, fishin’ and lovin’ every day: Just kidding, I don’t hunt – but my husband does so I can say it… We are so looking forward to truly enjoying our beautiful land year round. We can’t wait to go boating, bonfire-ing, fishing, hunting, snowshoeing, snowmobiling, ice fishing, you name it, in our spare time. Although this move carries plenty of excitement, all of this doesn’t come with out sacrifice. Minneapolis has been my home since 2007, 11 years - and it truly has felt like where I was meant to be. I made the big move to Minneapolis when I started college downtown Minneapolis - what then felt like such an intimidating scene, now feels like the back of my hand. I lived in every corner of the Minneapolis area it seems, from the suburbs, to multiple areas of Northeast, downtown and back to the 'burbs. Colton has been in Minneapolis for 6 years now and he also has managed to fit right in, starting from scratch when he moved here in 2012 from Moorhead. We moved in together for the first time in our quiet little apartment in Northeast Minneapolis, engaged, young and broke! I can still remember sitting in our living room talking big life decisions when I was transitioning into what is now my current job (very scary at the time jumping from big time advertising to a tiny startup) and Colton making sacrifices, working bartending jobs and literally knocking on business doors, asking for jobs until he landed his first real estate gig (precisely how he did, in fact). We have accomplished a lot here, learned much more and will forever keep with us the amazing memories and great friends we gained from our time here. 1. We got engaged here - and by ‘here’, I mean quite literally in that big blue overhang in the distance of the photo above, also known as the Endless Bridge at the Guthrie. We landed just blocks away from there when we bought our first place together! 2. We purchased our first home together (the downtown condo). Our downtown years were some of the most spontaneous, fun and exciting, it was a special time for the two of us as a couple that we will cherish and remember forever. 3. We got our first dog together (Stout) and spent countless hours exploring the city, just the two of us (sporting events, restaurants, breweries, beautiful walks and runs, go-to coffee shops, farmers markets, the list goes on). 4. We purchased our first single-family home + tackled our first fixer upper. What a journey! In our first ‘house’ together, we learned a lot and had quite the experience renovating and playing the role of architect/designer together. This experience taught us a lot about each other and better informed us on the process of renovation/building - we will be more equipped next time around thanks to this! We made a true home during our short time here and were blessed with the best little welcoming neighborhood. 5. We got our first Christmas tree together here, we hosted our first holiday here. We started new traditions here. ﻿6. We had our first child here. I so vividly remember my beautiful pregnancy, special momma and baby yoga throughout. 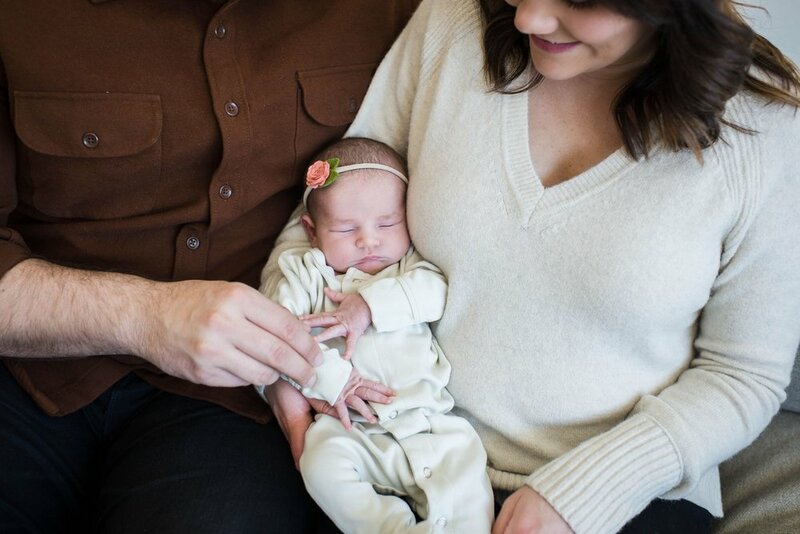 Our great experience bringing Maija into the world at Abbott Mother Baby Center and those first few months just the three of us acclimating to our 'new normal' in our home together followed by so many more unforgettable memories and moments that can never be replaced. All for the best, but moving north with definitely be a transition for us after living the city lifestyle for so many years - it’s been so fun and quite addicting with so many options at our fingertips. Trying all the new spots: we surly will be back to the Minneapolis scene periodically to check out new establishments but man has it been fun trying things as they come to down - whether it be a brewery, restaurant or new sport stadium in town. Spontaneity: I love the accessibility of spontaneously heading out for coffee, Sunday brunch or Saturday night pizza. Accessibility: This will be more of an adjustment and a slight change in how often we shop - now that Costco and Target will be 30 minutes away. No more last minute runs, more planning required! Friends and family: of course we are so sad to leave behind the ones that have stuck by us. We are moving further from a few full handfuls of amazing family and friends. Of course we will continue to see them, just not as often as we were and this will be our biggest negative. I guess this means more planned fun trips to Minneapolis, friends! Our home: the first single family home we renovated together, designed and styled every corner of that home together, specifically made for us. It will be VERY hard to leave. Not only do we love this home, but we got very lucky with such a welcoming, safe, quiet and amazing community of neighbors. We couldn’t have asked for a better spot to be a part of and we feel so lucky to have spent the time in this home and neighborhood. As our first ‘house’ together, as Maija’s first home and Stout’s favorite basement, this place will forever hold a special place in our hearts. This move is not best described as “bittersweet”; although hard thinking about all that we are leaving, we have so much to look forward to! I have consistently tried to remember that “home is wherever I’m with you” - wherever our crew goes is home and I have no doubt that we will make just as many if not more amazing memories on our next chapter - we are excited for what awaits us on the horizon!